213 M1 Carbine Trigger, NATIONAL POSTAL METER $45.00ea. 214 M1 Carbine Trigger, IBM $45.00ea. M1 CARBINE BARREL BANDS. Note: Type 1 & 1A bands are the same. The only thing different is that the early type 1 band had a narrow swivel (0.250 inches) wide and the type 1A band had one a little wider (0.320 inches) (hard to tell at a glance) All barrel bands are sold complete. 280 M1 Carbine Type 1A barrel band complete with swivel & screw- Rock-ola. Rock-ola bands are marked M-R or UR on the band. The swivels are unmarked $165.00 ea. 281 M1 Carbine Type 1A barrel band complete with swivel & screw- Saginaw S'G'. These are marked KV S'G' on the swivel. The band is unmarked with 3 spot welds. $179.00 ea. 290 M1 Carbine Type 1A barrel band complete- Irwin Pedersen. IP bands are marked UP on the swivel. The band is unmarked with 3 spot welds. $179.00 ea. 282 M1 Carbine Type 1A barrel band complete with swivel & screw- Quality HMC.These are marked QU or Q TK on the swivel. Most bands will be unmarked some are marked UI. The band will have 3 spot welds. $145.00 ea. 286 M1 Carbine Type 1A barrel band complete with swivel & screw- IBM bands will have a swivel marked KV-B. The band part will be unmarked with 3 spot welds. $145.00 ea. 283 M1 Carbine Type 1A barrel band complete with swivel & screw- Indland UI. The band is marked UI and most swivels are unmarked but some are marked UI. Some Inland bands and swivels are unmarked. All Inland bands will have 3 spot welds. $145.00 ea. 215 M1 Carbine Type 1A barrel band complete with swivel & screw, Unmarked $135.00 ea. 287 M1 Carbine Type 1A barrel band complete with swivel & screw, Winchester, Unmarked $135.00 ea. 289 M1 Carbine Type 1A barrel band complete with swivel & screw, NPM, UN on swivel $145.00 ea. 299 M1 Carbine Type 1A barrel band complete. Underwood bands will be unmarked and will have 3 spot welds. $135.00 ea. 298 M1 Carbine Saginaw Type 1A barrel band complete. The band will have 3 spot welds. $135.00 ea. 227 M1 Carbine Sear, ROCK-OLA $75.00ea. 231 M1 Carbine Sear, QUALITY HMC 49.00ea. 233 M1 Carbine Sear, SAGINAW S'G' $69.95ea. 235 M1 Carbine Sear STD. PRO. 45.00ea. 239 M1 Carbine Rock-ola type 1 magazine catch 115.00ea. 250 M1 Carbine recoil plate- IBM $45.00ea. 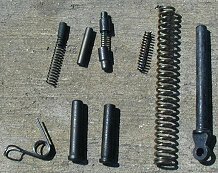 254A M1 Carbine recoil plate screw- STANDARD PRODUCTS $12.00ea. 254 M1 Carbine recoil plate- STANDARD PRODUCTS $65.00ea. 256 M1 Carbine recoil plate- UNDERWOOD $45.00ea.